According to the Twenty Year Review released by the Presidency, “Social assistance through grants is the democratic government’s most effective poverty-alleviation tool. The Social Assistance Programme has been expanding at an unprecedented rate, with the number of beneficiaries increasing from 2.7 million people in 1994 to 16 million people by 2013”. Child support grants were introduced in 1998 and initially targeted children aged seven and below. Over the years this was gradually extended to other age groups and by 2012, it also applied to children under the age of 18. Foster Care Grant, on the other hand, is also provided to children until they are 18 years, but it can be extended until they are 21 years, provided they are still at school. These children receive grants which assist their parents to meet the day to day material needs of these children. (The Children’s Act dictates that the Children in foster care, and still in school, are assisted until they reach an age of 21 ). As for the Child Support Grant, the children are expected to exit the grant irrespective if they are still in school or not. There are however challenges as there is no meaningful intervention that is rendered by the Department when these children exit the grant system and forfeit the grant. Having the protection of orphaned and vulnerable children as their key mandate, the Department of Social Development Free State and its key partners, Department of Education, South African Social Security Agency (SASSA) and Mangaung Metro, saw the need to launch an intervention programme “My Child is Your Child Campaign” to ensure sustainability and life-time independence for these children. The launch of the campaign was held on the 28th of June 2016 at Botshabelo, Kaizer Sebothelo Stadium, with more than 1000 learners aged between 18 and 21 years old present. The learners were from Mangaung Metro and Maluti-a-Phofung Municipalities. As part of the programme of the day, former grant beneficiaries were afforded a Speak-Out session where they expressed – ‘How Social Grant assist each as a person? and How will stopping the grant affect them?. Proposals for a solution were given by the beneficiaries. 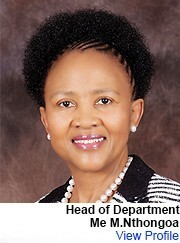 Through the ‘Adopt a Boy-child Project’, two boys were each adopted by the Free State Provincial Government Director-General – Mr Ralikontsane and his team of Heads of Departments (HOD’s) from their respective departments and a total of 18 (Eighteen) boys were adopted. The (FSPG) Administrative heads who adopted the children, committed to assist their adoptive children by linking them with socio-economic opportunities to enhance their well-being, by assisting with all their high school requirements, clothing and monthly groceries. The HOD’s also committed to become a father figures to these boys who never had the father figure in their lives for guidance and the warmth of the family life. The boys will be spending these holidays working with HOD Motau at the Department of Health and HOD Mokhesi at the Department of Human Settlement and during the upcoming Operation Hlasela Outreach programmes that will take place before opening of the schools in July. 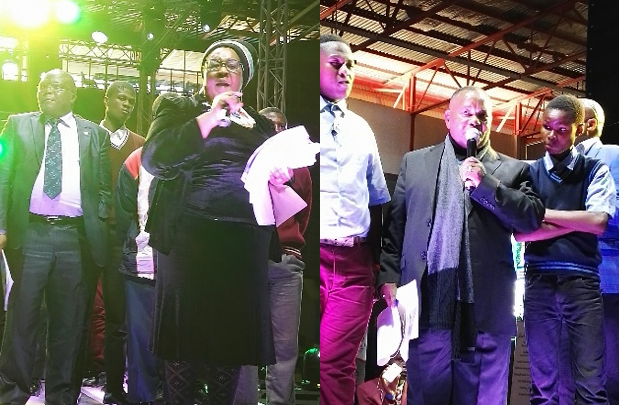 Minister Edna Molewa from Department of Environmental Affairs also adopted 3 boys and HOD for Social Development Me Mokone Nthongoa and HOD for DESTEA Me Matilda Gasela adopted the girls from destitute families.